Stand on the balcony of a downtown Saskatoon high rise and look west. It’s a depressing sight – asphalt streets and asphalt roof tops stretch out to the horizon with nary a touch of green to relieve the view. It’s not only aesthetically displeasing, it’s also a drain on the economy and on the environment. Let’s ignore the streets and just consider the roofs. Due to dramatic temperature swings, the average asphalt roof should be replaced every 15 years – a huge cost in terms of labour, material, and landfill. We’re all aware of Saskatoon’s cold winter temperatures, but you may not know that on a sunny day, the temperature on an asphalt roof will be as high as 158 degrees Fahrenheit or 70 degrees Celsius. Air conditioning units are usually housed on the roof, so they’re using vast amounts of electricity to take in and cool over-heated air. Residents of large urban areas are also confronted by higher temperatures as the built-up environment generates a heat island with temperatures that can be 5 to 10 degrees higher than in surrounding areas. Green roofs are an effective method of capturing and controlling storm water runoff and urban heat island effects. Not only do they absorb rainwater, filter out contaminants, and slow down run-off, they can cool the temperature on a sunny day from 70 degrees Celsius on a conventional flat roof to 32 degrees Celsius on a green roof. A green roof provides additional protection and can last two to three times as long as a conventional roof. Photovoltaic panels, which operate less efficiently at higher temperatures, benefit from the cooler temperatures on a green roof. Green roofs consist of a carefully constructed sequence of roof membranes, drainage layer, substrate, and plants. They are not a new technology as they’ve been used for hundreds of years to help control building temperature. They were reintroduced in northern Europe in the 1960s as a way to control storm water drainage and provide additional green spaces. Michael Molaro started his career with diplomas in Architectural Technology and Building Construction Engineering from the Northern Alberta Institute of Technology. He worked at the University of Saskatchewan for 27 years before retiring in 2013. In 2004, he hired the University’s first Sustainability Coordinator and oversaw the eventual establishment of the University’s Office of Sustainability. He brought the first LEED training to Saskatchewan and helped develop the first Building Saskatchewan Green conferences, starting in 2004. 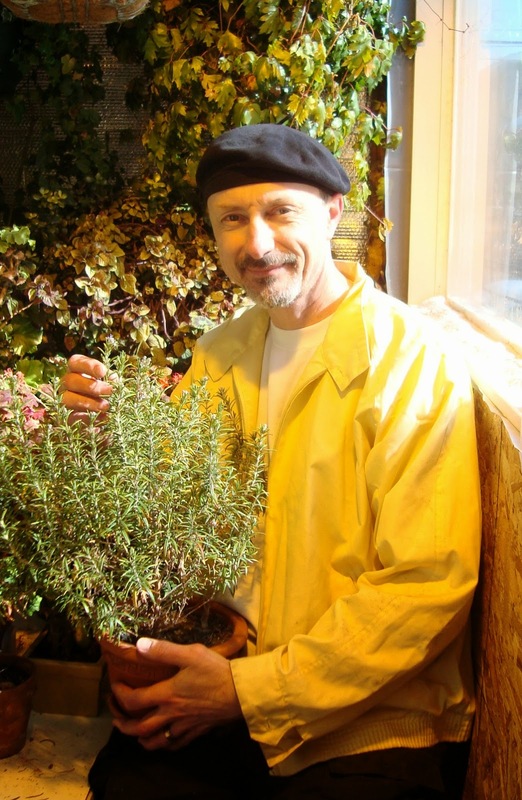 In 2005, Michael was part of a team of enthusiasts who established test green roof plots on the roof of the Dentistry building. Courses offered by Green Roofs for Healthy Cities enhanced Michael’s skills and understanding; he was accredited as a Green Roof Professional in 2013. 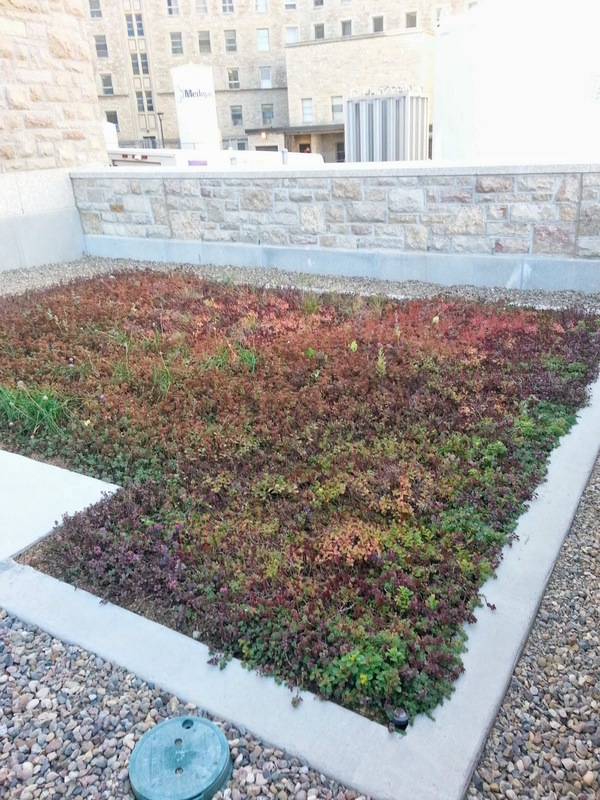 The first complete green roof in the province was installed on the College of Law Addition and designed by landscape architect, Goya Ngan. The roof isn’t directly accessible to the public, but they do harvest prairie sage for use in First Nations’ ceremonies, and the tall grasses capture snow in winter, providing additional insulation. Michael says that the soil medium is “where the magic happens.” You can’t use ordinary garden soil. Instead, you must use an engineered substrate that is lightweight, drains easily and yet retains moisture and nutrients, is resistant to heat and rot, and won’t shrink or compact. Green roofs that aren’t intended for public access have a shallow substrate and are often planted with sedums, which have shallow roots and are tough as nails. The Target Centre in Minneapolis is planted with native plants, which are adapted to the region and better able to withstand climatic extremes, pests, and disease problems. They tried growing lupines to provide food for the endangered Karner Blue butterfly, but the plants didn’t thrive. The roof can handle up to .9 inches of rainfall without runoff, capturing an estimated 20 million gallons of storm water a year. Green roofs commonly retain over 50% of the rain water that falls on them. The Vancouver Convention Centre has a 6-acre living roof, the largest in Canada and the largest non-industrial living roof in North America. There are four beehives and 400,000 indigenous plants and grasses. Its drainage and recovery systems are designed to collect and use rainwater for irrigation during summer months. The Brooklyn Grange in New York City operates the world’s largest rooftop soil farms, growing over 50,000 pounds of organically cultivated produce per year. North America has been slow to adopt residential green roofs. They are, however, beginning to appear. Toronto has set the standard for green roof development in Canada. They began by introducing incentives and followed them up with regulations. Toronto is the first city in North America to have a bylaw requiring and governing the construction of green roofs on new development. Toronto’s Guidelines for Biodiverse Green Roofs recognize the potential green roofs offer for providing plant, bird, and animal habitats. The guidelines cover everything from providing nesting opportunities for birds to lists of plants used by butterflies and caterpillars. Designing a civic facility (for instance a new downtown library) with an accessible green roof would demonstrate leadership and would provide patrons and staff with a green social space. Like any designed landscape, green roofs require some ongoing maintenance. “I’d like to see a condominium or cohousing unit build a green roof as they could assume ownership and look after the roof,” Michael says. Michael Molaro has set up a consulting company called Higher Groundwork HortiCulture and plans to focus, in the short term, on education, awareness, and advocacy. Be sure to get in touch if you would like further information. * Some Canadian municipalities have started charging a storm water tax. For example, Victoria’s storm water utility charges are based on the amount of hard, impermeable surface area (e.g. driveways, parking lots). The city is also developing a rainwater management credit program.